Fix for a problem where new games could not be started with certain worlds with this mod installed due to the world having "lotless" rabbitholes. Waiters will now first go to the table to take orders (animation requires Late Night) before going into the restaurant. They should also route closer to the table than before when bringing food to the table. If the rabbithole has multiple exits and a specific table was selected, sIms and waiters will now use the exit closest to the table. You can now have Waiters assigned to restaurant rabbitholes. 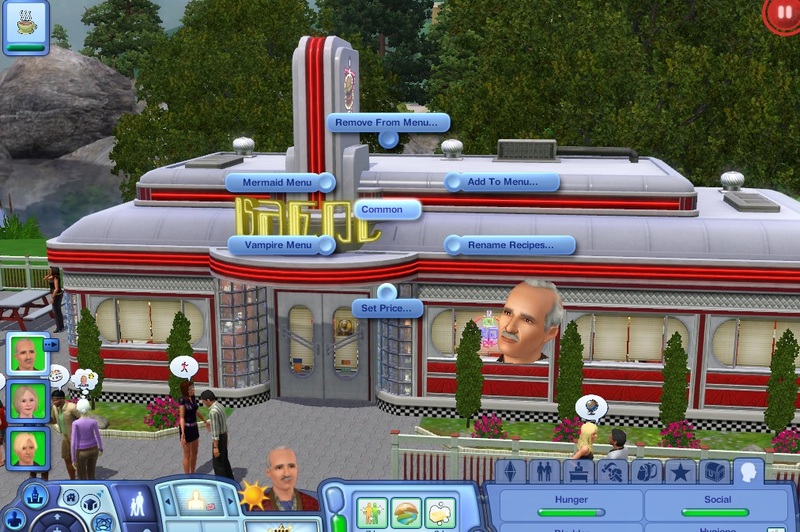 If there is a waiter on the lot, sims will sit down first to order instead of going inside, and the waiter will bring their food to them. See the Waiters section for more details. The Eat Outside... interaction is now available on all dining tables, picnic tables, bar tables and island counters on the lot. Clicking on a surface and your sim will (try to at least) to sit at that specific surface to eat instead of letting the mod choose one for them. Setting a restaurant's menu can now be easily done in just 2 windows, one for adding/removing recipes and another for editing a menu item's name/price/whether or not it is suitable for vampire/mermaids. Interaction is now always visible by default. To hide/restrict the interaction see the Set Menu section below. The mod now fully use in-game strings so no longer needs any translations. 8-MAY-2015: Potential fix for a reported bug. Also removed an unneeded ITUN from the package. 26-JUL-2014: Made a proper interaction for sims to eat inside during bad weather instead of using the original eat in interaction which sometimes causes pop ups to appear when inactive sims performed it. 11-JUL-2014: Menu should no longer pop up when active sims autonomously eat out on their own free will. 14-JUN-2014: Realized that sims would no longer autonomously dine outside with the version before this so had to reverse some of the changes I made then. 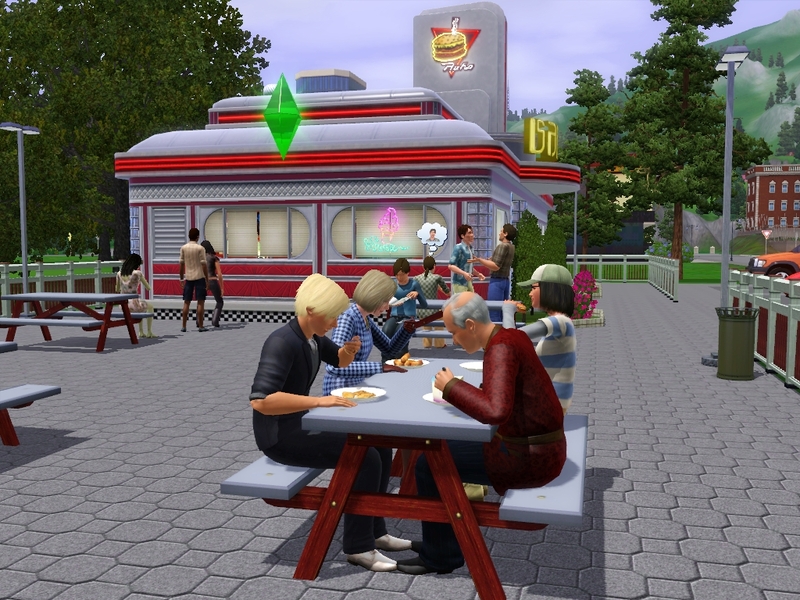 (Sorry to those who downloaded that version) Also made it much more likely for inactive sims to autonomously dine outside instead of inside rabbitholes now. 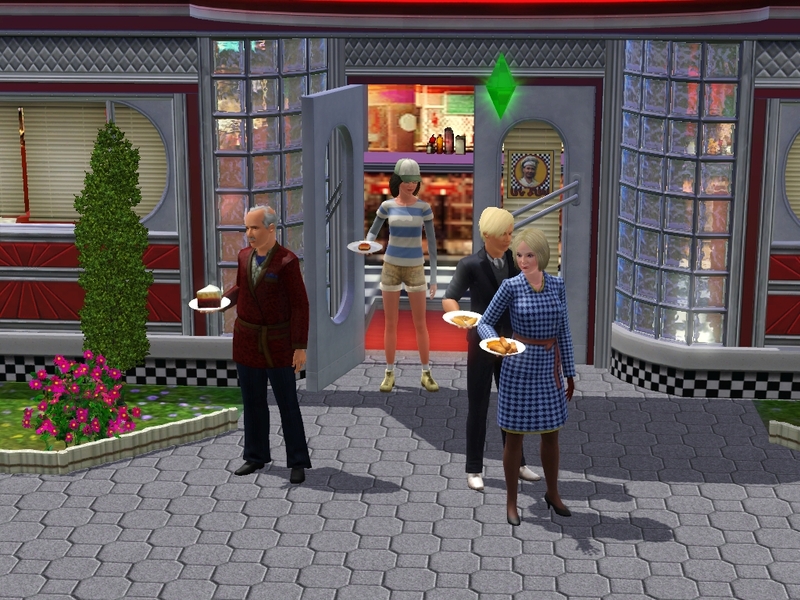 Sims will go inside the rabbithole to order the food before exiting outside to eat like in the original interaction. 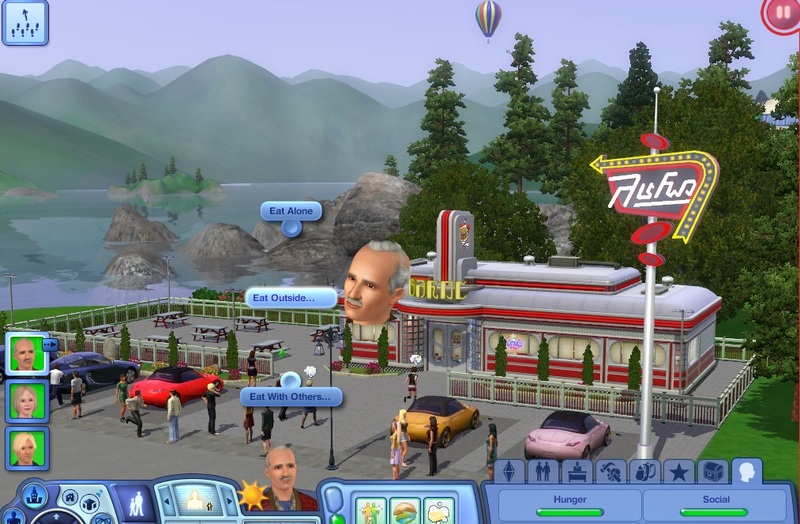 However, if there is a waiter on the lot, sims will first sit down outside and a waiter will come take their order before bringing their food to them from the rabbithole. 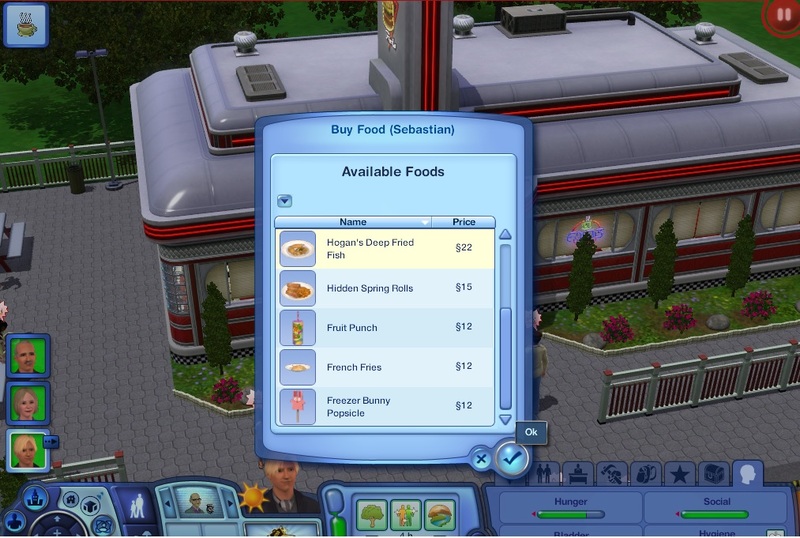 Each restaurant can have their own customizable menu. See the Set Menu section for details. Food quality is still random, but always between Normal and Great at diners and between Great and Perfect at bistros and the Eiffel Tower. If you want a sim or group of sims to dine at a specific table instead of letting the mod choose one for them, theinteraction can be accessed by clicking on the table instead of the rabbithole. Add/Remove: Choose which recipes go into the menu. TIP: You can add the same recipe multiple times and just change their names to add variety (or at least the illusion of it) to the menu. Once you've confirmed your choices the Edit window automatically pop up. Name: Rename the food on the menu, so you can make it something snazzy to match the restaurant, or have variations of the same item. Price: Set the individual lunch prices for the food on the menu (by default the higher between the recipe's register cost and the restaurant's lunch cost is used). This is the price sims will be charged for buying the food during breakfast/brunch/lunch (before factoring discounts for being a celebrity/being a chef/Lifetime Rewards, etc), slightly more is always charged for dinner. As of the 4-MAY-2016 update, the mod allows you to assign Waiters to restaurant rabbitholes. If there is a waiter on the lot, sims will sit down first and a waiter will come to the table to take their order (NOTE: the order taking animation requires Late Night). The waiter will then go into the rabbithole and bring their food to the table. The sims at the table are free to chat with one another while waiting. Assigning waiters is totally optional and up to you They might seem out of place stationed outside Hogan's Deep Fried Diner perhaps, but that local "fancy" bistro that has a reputation of forcing customers to carry their own food outside to eat could probably use one. Final build and testing done on patch 1.67. Base Game compatible, no expansions required. Current version of the mod no longer needs translation.